Measure B means more development, more traffic. Measure B, on the June 5th ballot is a Zone Change Ordinance written for the benefit of developer FivePoint. 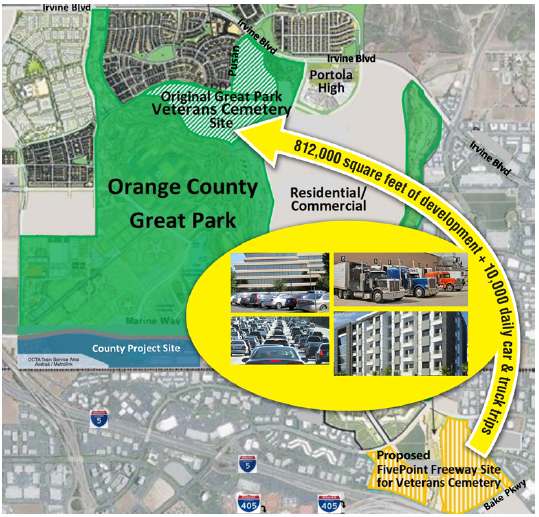 Measure B would rezone and replace the long-planned, 125-acre Veteran Cemetery in the Great Park with 812,000 square feet of office, industrial and apartment development. FivePoint’s massive development in the Great Park, along Irvine Boulevard, would bring 10,000 more cars and trucks to Irvine streets and neighborhoods every day. Also, under the FivePoint “land-swap” scheme, our Veterans Cemetery would be pushed out of the Great Park and moved 3 miles away to a site at the noisy I-5 & I-405 interchange (the El Toro “Y”). Sources: City of Irvine, Planning Department; Measure B (Zoning Ordinance 17-08). NextSchoolWatch: Getting Serious About School Security!